According to Wikipedia and CNN Business and other sources, the Great Recession was officially between 2007 and 2009. But as most remember it took a long time or seemed like too long a time to recover to pre-recession levels of business activity. Now the recovery is at 106 months plus which is close to putting it as the longest recovery since the 1991-2001 economy which set the record for the longest recovery. As a sidebar, I wonder how much longer that “recovery” would have continued if the attack on the World Trade Center and the Pentagon hadn’t derailed us emotionally? According to some economists and their theories, the recent recovery was unusually slow and business didn’t “roar back” as is more common. And that may have in fact be a contributing factor to the longevity of our current recovery. So it was a slower recovery but it has lasted a long time. Again from the economists (whoever they are), there is nothing on the horizon to say that the recovery won’t last until July 2019. Hopefully, we will keep going after that date. 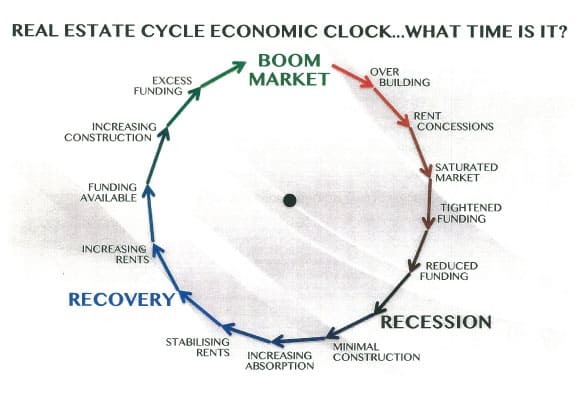 So with that as background where is Boise on the Commercial Real Estate Cycle Economic Clock? We may be early in the recovery stage with “increasing rents”. Please note that commercial real estate, as a rule, lags residential real estate by 18 to 24 months, so the residential market took off faster than our local commercial property sector. Office and industrial rents have been very slow to increase. And the low rents didn’t justify new construction until very recently. We are seeing more new industrial construction than office but that could change. Boise doesn’t have the explosive almost insane growth that San Francisco, Seattle, and Portland have experienced. For example, San Francisco office rents have surpassed the perennial champion of overpriced office space that always was New York City. San Francisco has CBD Class A rents of $75.00 to $80.00 per sf per year In San Francisco the cost to operate a downtown office building is $25.00 per sf per year. 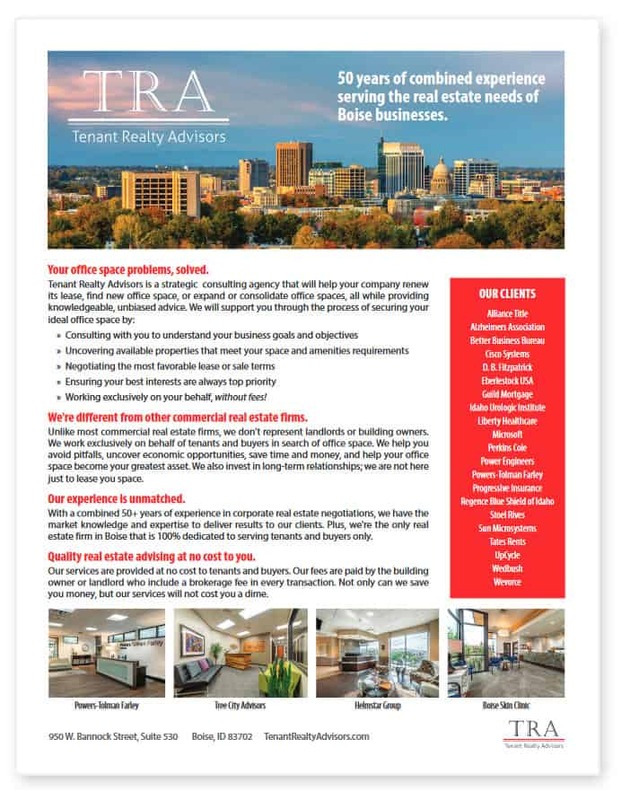 As the only exclusive tenant representative CRE firm in Boise we can help our clients secure downtown Boise high rise space for the same $25.00 per sf per year, except everything is all in including the rent. Yes – we don’t have the adrenalin rushes of explosive economic growth but we have not experienced the social upheaval and problems that are spawned by such growth. The cities of San Francisco, Portland and Seattle have seen housing prices and apartment rents rise rapidly and price out a lot of buyer and renters. For example, a two-bedroom, two bathroom apartment in downtown San Francisco can cost $4,500 per month. And now in Portland and Seattle (according to our commercial real estate broker friends there) both cities have traffic gridlock, housing costs escalating and huge problems with homelessness. Hopefully, Boise can dodge those bullets. We have “funding available” and “increasing construction” but in the case of industrial space depending on which report you are reading tenants are committing to most of the available space as soon as its available. Based on my 26 years of experience in marketing/leasing of primarily office space in the Boise market, I doubt that we will ever see significant “excess funding”. In my opinion, our local bankers and lenders are too cautious to make too many new project construction loans. We may avoid the “overbuilding” stage but rents are rising.